The One (And Only) Way To Sabotage Potential! 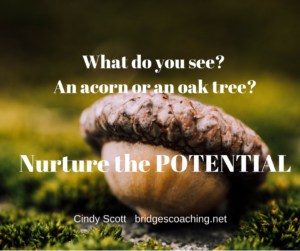 Tucked away perfectly in the tiny acorn is the potential for a mighty oak tree! The only way that’s not going to happen is if the dear acorn is not nurtured. It needs little to flourish but the recipe is clear. There needs to be healthy soil, adequate moisture, available sunshine and a good location (climate wise). Humans are like that too. We need nurturing to grow into all we could become. We need healthy soil. It’s like a having a healthy soul where the weeds (lies) are not taking all the nutrients for themselves. We need adequate moisture. The River of Life is available to us all. It is an underground spring where God can bring freshness and life to our inner man. We need available sunshine. When God shines on our nexts everything changes. Our part is in the waiting. Some times it’s not sunny when we want it to be and it’s in the waiting that our roots grow deep. His timing is always perfect.